Susanne is responsible for environmental regulatory compliance for water supply, stormwater, air emissions, spill prevention, and composting at Colorado State University. She has a BS degree in Civil Engineering from Michigan Technological University (1983) and an MS degree in Environmental Engineering from the University of Southern California (1985). Carol Dollard is an Energy Engineer at Colorado State University. In her nearly 18 years there, she has helped the University design, operate & maintain the university’s utility systems. These efforts include millions of dollars in efficiency projects – reducing water & energy use on campus despite an increase in both enrollment & square footage. She is a licensed Professional Engineer, a Certified Water Professional and a LEED AP. A college or university must provide potable water and manage its water distribution system to serve hundreds to thousands of people each day. Those that do not own and operate the water distribution system serving their facilities should work closely with their water purveyor to ensure that reliable water of high quality is delivered to their facilities. The water quality must meet regulatory standards and must be aesthetically pleasing. The potable water will be used for drinking, but it may also serve a plethora of other uses such as research, instruction, cleaning, irrigation, animal husbandry, and fire protection. Many universities use nonpotable water for irrigation and other applications, such as cooling and washwater. This chapter addresses some of the issues and topics encountered when a typical university supplies safe and pleasant water through its potable water utility. The major elements of water supply are the water source, treatment facilities, storage systems, and the distribution system. A small college or university in a rural setting may be responsible for all of these aspects of water supply, including identifying and caring for the source. However, most colleges or universities are located within a municipality or water district that supplies treated water to their distribution system; therefore, the distribution system is the focus of most universities' potable water utility. In this chapter we briefly address the source, treatment, and storage system elements of water supply and provide a more in-depth discussion of distribution systems. We also touch on some unique aspects of small systems. The final part of this chapter addresses regulatory requirements applicable to safe drinking water. Visiting groundwater wells annually and requiring that chemical storage tanks be kept at least 200 feet away from the well head. Establishing de-icing programs that minimize the amount of salt runoff entering the source water area. Each source protection program will be tailored to the situation depending on the type of water source and intensity and types of operations in its vicinity. The size and source of a water system dictate the type of treatment required. The smallest and simplest systems require disinfection as a minimum treatment. If the source is surface water or groundwater under the influence of surface water, then filtration may also be required. Larger systems must implement treatment that meets turbidity requirements and contaminant levels and includes disinfection. Complex water treatment systems may consist of numerous unit operations, from basic multimedia filtration to ultrafiltration or reverse osmosis. It is important for system operators to have a basic understanding of where their water comes from and how it is treated so that if problems arise, the situation can be assessed efficiently. Municipal water treatment operators are typically eager and available to provide tours of and information about their treatment facilities to college and university Facilities personnel. Getting to know the personnel at your local water utility and learning what resources they have available is also valuable in the event of an emergency situation (such as a water main break or cross-connection). Areas with relatively flat topography may need elevated tanks in order to get sufficient water pressure consistently. These water towers provide additional benefits, including balancing the supply over daily variations in consumption patterns or extreme consumption such as firefighting. The towers can also provide water for a period of time if there is a pump failure or power outage. One of the significant benefits of water storage tanks is that the system pumps can be sized to meet lower flow volumes. This is because during times of high demand, tank levels can be drawn down. However, operators must watch the "residence time" in these tanks so that water quality does not deteriorate substantially. These facilities need regular maintenance, including painting (both inside and out), periodic disinfection, and regular checks to ensure that all vent screens are intact. Storage tanks should be inspected periodically; inspection frequency might be dictated by State or local regulations and may be as frequent an annually. If no regulations exist, the AWWA recommendation of once every three years should be followed. In addition to storage tanks that might serve a whole campus, it is common to have booster pumps and storage tanks on buildings too tall to be served by street pressure. Static pressure losses accrue at 0.433 psi/foot, so there is a loss in static pressure of about 5 psi for each story in a multistory building. Most plumbing fixtures require pressures in the range of 25 to 35 psi in order to function properly. If a booster pump is used in a building with fire sprinkler protection, backup power (typically an emergency generator) is required so that fire sprinklers can still operate in the event of a power failure. Campus fire protection is generally part of the domestic water distribution system. Fire flow requirements for each building take into account many factors such as occupancy load, size of building, construction materials, and usage. The state fire marshal and local fire protection districts set fire flow requirements or necessary fire protection measures for each building on campus. Typically, fire flow requirement for campus facilities vary from 1,500 to 3,500 gpm with 20 psi residual pressure. Check with your local officials for specific requirements for your location. Some of the earliest water systems in the United States were constructed using wooden water mains; however, cast iron, ductile iron, steel, and copper were the standard for these systems for much of the 20th century. Recently, advances in plastic pipe (high-density polyethylene, and PVC, for example) have brought more of this type of pipe into water utility systems. Plastics have some significant advantages in weight and cost, but there are some issues with pressure ratings, and none of these pipes have been in the ground long enough for us to really understand the longevity of these systems. While many of the plastic pipe materials appear to have good long-life characteristics, connections may have less reliability and further research is needed in the area of leaching of organic chemicals from the pipe material into the water. 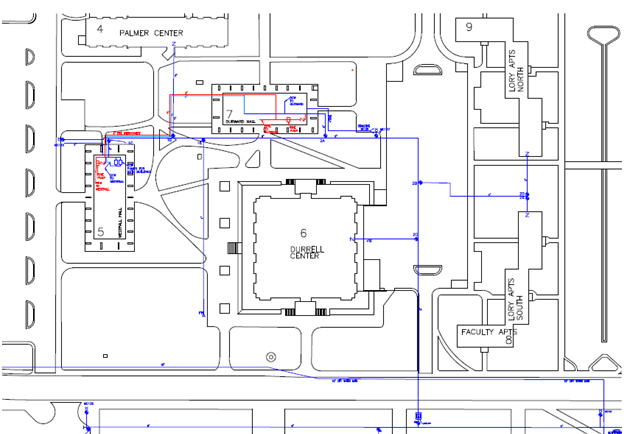 When designing water distribution systems on campus, it is important to analyze the criticality of water supply to each building type. While the loss of water supply to a classroom or office building could be merely an inconvenience, the loss of water supply to laboratory or animal care facilities for even a relatively short period of time could endanger critical research. In addition, those buildings that on the surface do not appear to have critical water need may have HVAC equipment like a boiler or cooling tower that rely on makeup water. Should a water outage render those pieces of equipment inoperable, the building may no longer be habitable. Once these critical loads have been identified, the water system can be designed (or upgraded) so that the water distribution piping network is looped and water can be fed to critical buildings from multiple sources. A critical element of a looped system is providing a sufficient number of valves so that sections of pipe can be isolated for repair and maintenance without impacting water service to multiple buildings. Typically, there should be a valve on each leg at each pipe intersection (three valves at a "T" and four valves at a cross) and a valve on every building service line. However, you can get away with fewer valves if there are several pipe intersections in close proximity with valves at each leg. The best test is to study water system maps and perform a "what if" analysis on the impacts of water main breaks or repairs. If a particular section of pipe will "take down" several buildings in the event of a failure, analyze how to retrofit valves into the system in order to minimize the impacts. Radial feed legs within the water system should be minimized due to reliability and potential water quality concerns. In addition, it is critical to minimize "dead legs" in the water distribution system. Dead legs are created when there is a long radial feed to a seldom-used load. Fire hydrant legs are a common culprit, but old feeds to abandoned facilities are sometimes cut off at the building rather than at the main, causing a dead leg that can create water quality problems in the system. The water in these dead legs is stagnant, and fluctuations in pressure and flow can draw some of this bad water back into the water mains, causing water quality issues. There is a downside to looped water distribution systems. Water will always follow the path of least resistance, so if there are different pipe sizes in the water distribution system, the water flow in the smaller pipes will be low. This can lead to water that has too long a residence time in the system, resulting in a degradation of water quality. In extreme cases, some of these smaller pipes can act almost as dead legs, leading to severe water quality problems. If there are a variety of pipe sizes in a looped distribution system, regular, directional flushing can help alleviate these water quality concerns. Additional design efforts should be put into minimizing pressure drops in the system. Most utility systems provide water at 50 to 80 psig. If the water pressure is outside that range, efforts must be made to correct the situation. If the pressure is too high, a pressure-reducing valve (PRV) must be installed at the building entrance. If the pressure is too low, a booster pump and pressure tank are usually required. Note that providing a looped system will not help low water pressure problems; however, it can improve water flows in systems with marginal pressure. Water conservation measures are an important aspect of a sustainable future, especially in arid areas like the western United States where the scarcity of water becomes the primary topic of conversation in drought years. However, drinking water contaminant levels are concentration-based; therefore, when more water (i.e., less conservation) is moving through a distribution system, it is more likely that the water quality will meet applicable limits. Another incentive to move large quantities of water is to prevent the water from stagnating in pipes, where it can pick up rust and other contaminants that may not represent a health threat but make the water unpleasant to taste. High water age, caused by low flow, can diminish the disinfectant concentrations, leading to possible bacteria growth, and exacerbate the formation of disinfection by products such as chloroform. Historically, water distribution systems have been designed to provide more than adequate flow capacity for the largest demand, which is fire flow. This can result in mains and service lines that are oversized for most of their use, which is the demand in the building, resulting in stale water that may be warm or bad-tasting and potentially contain bacteria or disinfection byproducts. Implementing conservation measures while providing healthy and pleasant-tasting water is a balancing act. We must continually reduce a building's water demand through low-use fixtures, laboratory modifications, and other conservation measures, but still ensure healthy and pleasant water. One way to understand the impacts of water conservation measures on the distribution system is to model the system and test different scenarios. These computer-based models are time-consuming to set up, but invaluable for testing out changes in the system before implementing them. Water modeling at Colorado State University, for instance, allowed utility engineers to determine that a section of failed pipe was not required to maintain adequate flows in the system. As a result, an expensive repair was avoided and the pipe section was cut off from the system. The operating plan should describe whether each task or event is an emergency or a non-emergency, and what steps to follow. Some states offer guidance or have regulatory requirements that dictate the notification and actions required in each circumstance. Water System mapping showing domestic water distribution lines, fire lines, pipe sizes, and fittings. Valve locations: These are important in times of emergency, such as main breaks. 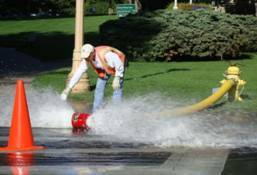 They are also important for planning unidirectional flushing, system replacement, and upgrades. The direction of valve operations should also be noted on the map (e.g., "open counterclockwise"). Main locations, size, and material: A pipe's size and material can affect flow and pressure characteristics at the delivery points. Accurate size and material information helps troubleshoot flow and pressure problems. Age of the pipe: Pipe age is helpful in water quality and flow modeling and helps guide replacement and repair programs. It also provides necessary information to help you comply with water quality testing regulations of contaminants such as lead and copper. Locations and dates of breaks: This information is needed for system replacement and rehabilitation planning. Locations and dates of complaints: This information is needed for system evaluation, replacement, and upgrade planning. Mapping can be performed using AutoCAD software, GIS software or both. If both are used it is important to have a process for establishing one type of software as the master, with the other being updated promptly after changes are made to the master. Symbols for valves, fire hydrants, meters and backflow preventers can be standardized using symbol libraries provided with the software, or developing user-specific symbols. Pipe and fitting symbols are less universal today than they were a decade ago, therefore it is helpful to provide a legend for the map users. Typically, each valve is assigned an identifier and shown on the map at its actual location relative to buildings and other permanent objects. Other information about the valve, such as direction of closure and GPS coordinates, might be embedded in the map at the valve location. Methods of locating valves in the field vary depending on the resources available to the user. A user might query the map electronically at his or her computer to determine relevant distance to the valve from fixed objects, mark these on a to-scale printout and take it to the field as an aid in finding the valve. Utility locating equipment and a metal detector can help pinpoint a valve box lid that has been buried. GPS units are helpful if the valve's coordinates are known. Mapping is an ongoing process and relies on field measurements and observations to develop accurate and to-scale maps that are useful electronically as well as in hardcopy format. Maps must be continually and promptly updated to show changes reflected on construction as builts. It is helpful to have a copy of the distribution system on your smartphone, tablet, or laptop for use in the field. Water leaks often account for a substantial portion of lost revenue in water utility systems. If you have a campus that either treats its own water, or purchases water at the campus boundaries and maintains a distribution system, water leaks are a direct revenue loss to the water system. For example, if 5 percent of the water in the Colorado State University water distribution system were lost to leaks, it would be at a cost of over $100,000 per year. A wide variety of strategies and technologies can be used to pinpoint leaks. These include water balance comparing submeter to master meter usage, field observations, and a variety of listening devices. The effectiveness of these strategies is related to the pipe material in your system, depth of installation, soil type, and so on. Often a preventive maintenance (PM) program of actively monitoring water mains to find and repair leaks can pay for itself with the water saved. If resources are not available, or if the system is not owned by the university, a PM leak detection program may not be cost-effective. However, in order to preserve and protect the integrity of their system, water utilities often provide this service for little or no cost. A simple and cost-effective leak detection unit consists of electronic ground microphones. These are listening devices that can be used at valves, hydrants or along a water main alignment. Ambient noise such as traffic can interfere with the use of this type of equipment, therefore it is best to attempt to identify leaks using this equipment when ambient noise levels are low, typically very early in the morning or at night. Select an appropriate listening device for the location where you want to begin listening – elephant foot for asphalt or concrete surface, probe rod for landscaped area, or magnet for fire hydrant. If a leak is not located with certainty using this equipment, then subsequent steps might include isolating the suspect segment of pipe and rechecking to see if noise has disappeared. It is important to attempt to differentiate between normal water movement in the pipe and a leak. One way to differentiate between usage and a leak is to cease water movement in the pipe (for example by shutting off the water at the nearest building). If a leak is difficult to locate, then correlator leak detection equipment might be needed. Correlators can be purchased or rented, or a firm specializing in leak detection retained to conduct the investigation. You can arrive at an estimate of losses due to leaks when you compare these consumption volumes (after accounting for storage) to the volume of water supplied at the master meter(s), If the amount of losses due to leaks exceeds ten percent of your annual consumption then it is appropriate to initiate a rigorous leak detection evaluation of the distribution system. Keep in mind that inaccuracies in the water audit can be introduced due to water theft and meter inaccuracy; both of these should be considered and addressed if possible. Rust, tuberculation (deposits of corrosion products), sediment deposition, and slime growth are aspects of pipe deterioration and stagnant water that can result in poor water quality. Periodic water main flushing using system hydrants helps to remove these impurities and improve flow. The frequency of flushing may vary from three times per year to once every three years, depending on the system's age, configuration, and condition. Areas of the distribution system with long dead-legs or low water usage may require more frequent flushing than other areas. View a video of a hydrant being flushed. If parameters are not achieved, flush for no more than 15 minutes per hydrant. 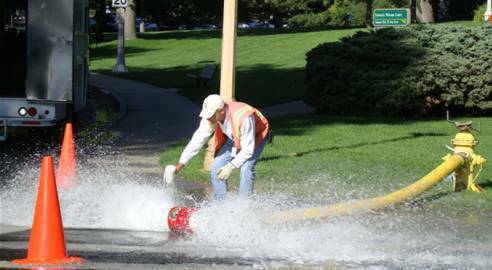 Left: Sampling a fire hydrant during unidirectional flushing. Note diffuser and safety cones. Right: Measuring pressure during unidirectional flushing. Coordination with the wholesale supplier: Unidirectional flushing can dislodge materials in the mains that may appear in customers' water in another location. If flushing with the wholesale supplier is not concurrent, it is important to notify the wholesale water purveyor so that it can be prepared to respond to any complaints. Notification to all system users: This may take the form of a mailing or campus-wide e-mail. A sample notification paragraph is shown in Exhibit A. Special notification and coordination with sensitive users such as hospitals and dialysis patients. Preparation of equipment for each crew, including diffusers, safety cones, dechlorination equipment, sampling kits, and valve keys. Compliance with any dechlorination requirements: These may be imposed at the state level by the environmental agency having jurisdiction over surface water discharges. Requirements may vary from no action required to dechlorination at every fire hydrant. Mapping of each area with valve closures planned out in advance. Plan the days flushing with an effort to minimize customer disruption. Notify any "critical" customers that may need to turn off sensitive equipment. Close requisite valves slowly to avoid water hammer. Mark closed valves on map as they are closed. Set up at hydrant with pedestrian, bike path, and traffic protection (cones, flaggers, etc., as appropriate). Open fire hydrant for flushing slowly, to avoid water hammer. View video. During flushing, watch for flooding or erosion. Sample at start and every five minutes. Observe quality periodically (Styrofoam cup works best because white cup allows for easy visual inspection for particulates). Cease flushing if system pressures drop below 20 psi or clogged catch basins cause flooding or erosion. When the goals are met, close fire hydrant slowly to avoid water hammer. Open the closed valve and mark each on the map (or erase "closed" marks made earlier) as it is opened. Checking water quality. Sample and check visually and by testing every five minutes. View video on chlorine testing of water sample. A sample flushing documentation sheet is included as Exhibit B. One sheet per hydrant being flushed should be used. During flushing, care should be exercised in the operation of fire hydrants. To avoid water hammer, the hydrant should be opened slowly; likewise, when closing a hydrant, the last several turns should be very slow. 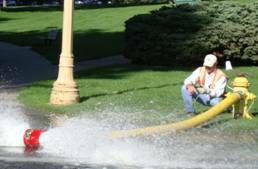 One instance of rapid fire hydrant closure at a university resulted in water hammer causing a five-foot longitudinal break in a 40-year-old cast iron water main that was otherwise in excellent condition. A dry barrel hydrant should always be opened fully, not partially, so that it does not saturate or erode the dry well at the base and drains properly when closed. The most common method appears to be option 2, where tablets are taped inside the pipe sections during installation and the pipe is filled with water and allowed to sit for 24 hours before flushing and testing. Superchlorinate piping and fittings (using one of the approved methods described above). Allow to set for the appropriate contact time. Dechlorinate, by discharging to pre-planned location. Flush to background chlorine concentration (approximately 0.5 mg/L). Measure chlorine before and after flushing. Collect sample for bacteriological analysis (coliform). Review results, usually available after 24 hours. If "negative" result (i.e., no coliform present), okay to activate new piping. The volume of water to be handled depends on the pipe size and length and on the initial superchlorination concentration. When planning the discharge, remember to account for the initial pipe volume plus an additional two or three pipe volumes for concentration reduction. When the concentration is reduced to the potable water supply concentration, discharge can be in accordance with local or state discharge of potable water requirements. Exhibit C is an example of a form that Facilities personnel can provide to contractors to use for pipe disinfection activities. Distribution system operators' primary responsibility is the delivery of safe and pleasant water. All customer complaints should be taken seriously and addressed promptly. Complaints may come via phone or e-mail or in person to any of the Facilities personnel. The complaint may be delivered in a courteous fashion or with frustration. Regardless, the person receiving the complaint should listen and indicate what steps will be taken. There should be a procedure for conveying the complaint to an appropriate person at Facilities, investigating, and following up. Any follow-up work will depend on the nature and cause of the poor water quality. It may entail simple steps such as explaining analytical information or changing out a plumbing fixture, or it may require complex steps such as relining service lines or altering the characteristics of the water entering a building. The type of solution will be unique to each situation. Note that some complaints may be related to factors beyond your control and the solution may simply involve educating the customer. Exhibit D is a sample complaint tracking form that can be used for each customer complaint received. Complaint dates and types can be included as a layer in the utilities mapping effort. Mapping the location and date of each complaint can help illustrate patterns indicating distribution system problems. Though it depends on the cost of water in the area, typically, obtaining water meter data down to at least the building level is a sound investment for an institution. Detailed water consumption data are important to identify problems in individual buildings. In addition, individual building totals can be compared to master meters in order to identify leaks in the distribution system. Of course, reading and logging the data on a regular basis is an ongoing expense; however, utility database software can help manage the task. An example of how metering can be useful: One university's equine facility had horse waterers, and a leak developed in one of the underground lines serving them. The ground was shale in that area, so the water disappeared underground and there was no trace of the leak at the surface. When the monthly reading for the building submeter came in hundreds of thousands of gallons above normal, an investigation began that led to the discovery of the problem. If there had not been a submeter, the leak would have gone undetected in the noise of the much larger campus-wide master water meters and could have continued for months or even years. Some universities are utilizing real-time metering, which provides nearly instantaneous feedback on utility use. If the data can be managed and appropriate "alarm" levels established, these metering systems can be quite valuable in quickly pinpointing problems in the system. However, on many campuses, Facilities staff is stretched too thin to set up, maintain, and monitor systems like this, thus limiting their value. Meters are intended to measure and display the amount of water passing through a given point in the system. At least eight different types of meters are available, depending on the flow range to be measured and the pipe size where the meter is to be installed. The following table lists different types of meters, their capabilities, and typical applications. Large (e.g. 2” to 36”). Often used for irrigation. Inaccurate a low flow rates. Large. May be used for source water or fire flow. Should not be buried. Large. May be used for source water or fire flow. Large. Used for industrial applications. Should be kept dry. When using compound meters, the meter displays are summed for the total flow through the meter assembly. Under high flow conditions, both measuring assemblies are operating. Meters should be installed properly to increase accuracy; inadequate straight pipe runs before or after the meter can cause significant inaccuracy. Meters should be checked periodically for accuracy, which usually means removing the unit and sending it to a testing laboratory. Testing frequencies range from one to four years, depending on meter type and size. AWWA standards for different types of meters describe each meter’s required characteristics for use in water distribution system applications, also, AWWA publishes several manuals on water meter selection, installation and sizing. States must keep a register of qualified operators who have met the state requirements developed under 40 CFR.142.16(h)(2). A certified operator program typically has different levels and types of certified operators, each with a specific set of requirements and tests. For example, there may be four or more classifications of water treatment facility operators depending on system type and size, and three or more classifications of distribution system operators depending on population served. To evaluate the certified operator requirements appropriate for your system, visit your state's environmental agency Web page and contact the person in charge of your state's certified operator program, or the applicable EPA regional office, contact information for which can be found at www.epa.gov/epahome/regions.htm. Note that the registration and scheduling for testing can be a lengthy process requiring many months. Threats and disasters such as earthquakes, floods, fires, tornadoes, extreme weather conditions, terrorism, and power outages are events for which water system managers must plan. If the operational staff is not prepared to take necessary action to minimize the effects of such disasters, these problems may cause a greater impact in terms of loss of life and property. Some of the most critical elements of a water distribution system during a disaster are storage, pumping, and the ability to deliver safe drinking water from alternative sources. Earthquake-related emergencies are often followed by fire and power outages. Therefore, if a distribution system relies heavily on pumping, a lack of electricity and a shortage of storage capacity could curtail or reduce the ability to fight a fire. It is important to have either diesel or natural gas generators to run pumps as a backup. Once a crisis is under way, communication with the public and the media is crucial for effective management. Most educational institutions have progressed dramatically in the last few years to develop an incident response protocol and team, with directions on who contacts the media, when, and with what information. If procedures for communications have not been planned, they should be considered and incorporated into the emergency operations plan. A cross-connection is a general term for when nonpotable water is introduced into the potable water system. It can cause contaminated water to mix with the water supply and potentially cause dangerous conditions. It is the responsibility of the water purveyor (the local water utility or the university if it owns the distribution system) to ensure safe drinking water; therefore, that entity is usually responsible for minimizing the risks of cross-connections. While cross-connections directly to the water utility do occasionally occur, most cross-connections occur through backflow events (backpressure or backsiphonage). A back-siphon occurs when there is low or negative pressure in the water distribution system. A classic example often seen on a university campus is a hose attached to the faucet sink in a laboratory building. If that hose is lying in a sink filled with wastewater and a low-pressure event occurs in the local water system (a water main break or hydrant being opened), that wastewater can be siphoned back into the potable water supply. Backpressure, on the other hand, occurs when a nonpotable source is connected to the potable water supply and the nonpotable source operates at a higher pressure. For example, a greenhouse irrigation system might be connected to a nonpotable water supply in the summertime when it is available, but then operate on a potable water supply in the winter when the untreated irrigation water is unavailable. If these systems are not properly isolated, the nonpotable supply could operate at a higher pressure than the potable water system and there is significant potential for cross-contamination. There are four types of backflow prevention (BFP) devices: vacuum breakers, double check valve assemblies (double check), reduced pressure (RP) backflow assemblies, and air gaps. An air gap is the simplest and most reliable BFP device, but it is not practical in all applications. What type of BFP device is called for in each situation is a function of level of potential hazard (how easy would it be for that device to backflow into the water supply?) and the potential risk (what are the contaminants present that could affect the drinking water supply?). The local water purveyor will likely have regulations stating which situations require which level of protection. Another helpful resource is the AWWA manual: M14 Recommended Practice for Backflow Prevention & Cross-Connection Control, Third Edition (2004). To protect the drinking water supply from cross-contamination, it is important to look at the problem from a variety of levels. First, identify potential sources (laboratories, boiler makeup, cooling tower makeup, etc.) and provide protection for the other occupants of that facility. Often an air gap can be used, but a testable BFP device may be required. The next level of protection is to provide a BFP device at the building entrance; this protects the buildings within the campus from being affected by any events in the adjacent buildings and protects the water main. Finally, the local utility may require BFP devices at all metering points, which in a master meter situation will result in BFP protection at the campus level. Approved testable reduced pressure backflow prevention (BFP) devices (two in parallel to avoid disruption of water supply to building during annual testing). One additional level of protection, used in some high-risk buildings, is to have both a "domestic" and "industrial" plumbing system within the building. The domestic system serves kitchens, bathrooms, and drinking fountains areas where occupants are likely to drink the water. The industrial water would supply laboratory sinks and mechanical equipment. These two systems would be isolated with BFP devices (often an RP device) at the building entrance. Note that in this scenario there must be separate piping for both hot and cold water. Maintaining BFP protection requires significant staffing resources. Both double checks and RP devices require annual testing and maintenance. During this testing, water has to be shut off. Because of this, Colorado State University has made it our standard to install two devices in parallel at each building entrance in order to avoid a water outage in the building (the devices can be isolated and tested independently). This greatly simplifies the testing procedure but doubles the number of devices that have to be tested. At CSU, currently more than 700 BFP devices are being tested annually. Testing BFP equipment can have a large impact on maintenance budgets. The testing must be completed by certified testers. On large campuses, it is likely that in-house staff will retain this certification and conduct the testing. One more thing to consider when designing for the installation of BFP devices: RP devices provide one of the highest levels of protection; however, they have the potential to dump substantial volumes of water. There is a failure mode that could result in a continuous dump. As a result, it is imperative when installing these devices that adequate drainage be provided in equipment rooms and that floor drains are kept clear of debris. 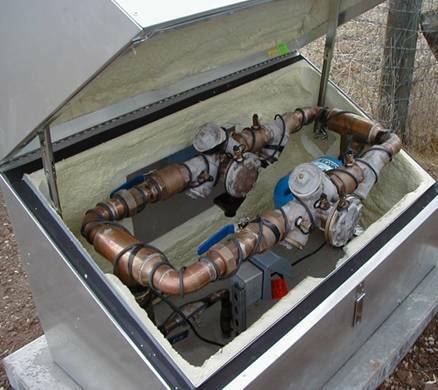 Another option is to install these devices outside so in the event of a dump, they can drain harmlessly outside the building, but an RP device cannot be installed below grade, so in freezing climates they must be put in insulated and heated boxes. Backflow prevention devices located outside in hotbox to prevent freezing. Reclaimed water and gray water are all seeing broader consideration for use in irrigation, toilet flushing, and fire protection water systems. While some states still limit use of reclaimed water, those statutory restrictions are being reevaluated. Check with your local water utility for any restrictions on using reclaimed water. Some examples of methods and benefits are described in the following paragraphs. Gray water used for toilet flushing and irrigation. Sink, shower, and laundry water can be collected, filtered, and reused for toilet flushing and irrigation. The benefits include conservation of treated water and lower utility bills. Reclaimed (treated) water in a separate system for fire suppression. Treated wastewater, while not typically suitable for reuse as potable water, can be stored and used for fire-fighting.1 This requires a dual distribution system: one for potable water and one for fire flows. Benefits include smaller pipe diameters for the potable system with lower cost and lower water age, resulting in fewer quality problems. Disadvantages include higher capital cost for dual distribution systems. Reclaimed water injected for saltwater intrusion barrier. Treated wastewater can be injected in coastal areas to hold back saltwater threatening intrusion into drinking water aquifers. Dual systems can be used in buildings in accordance with the International Plumbing Code's (IPC) requirements. Piping used for recycled water must be purple in color. Denver, Colorado, has a large-scale purple pipe distribution system that uses treated wastewater for industrial and irrigation applications. Some communities with concern over cross-connections or backflow into potable systems still resist use of raw or gray water for irrigation systems. This underscores the importance of a robust cross-connection control system and diligence in testing and record keeping. The size and source of a water system dictates the type of treatment required. The smallest and simplest systems require disinfection as a minimum treatment. If the source is surface water or groundwater under the influence of surface water, then filtration may also be required. Larger systems serving nontransient populations of more than 10,000 must implement treatment that includes disinfection and also meets turbidity requirements and contaminant levels. Most problems and the highest numbers of violations in small systems are associated with coliform sampling and data evaluation. Problems include noncompliance with monitoring frequencies and incorrect data calculations. Most state environmental agencies have representatives designated to assist small systems. The regulators are invariably very helpful and usually more interested in bringing systems into compliance than in levying fines. Drinking water is regulated under the Safe Drinking Water Act (SDWA) of 1974, and its amendments. The federal regulations promulgated under the SDWA can be found in 40 CFR Parts 141, 142, and 143. Most states have been given primacy, and the state's environmental agency is the primary authority for enforcing the federal regulations. The state regulations often closely follow the federal regulations. Drinking water regulations govern treatment, monitoring, distribution, and reporting requirements. Specific safe drinking water regulations have been promulgated for a plethora of topics, including contaminant levels for dozens of constituents (including coliform, lead, copper, arsenic), surface water treatment, groundwater, filter backwash recycling, disinfection byproducts, radionuclides, public notification, standardized monitoring, variances, sampling requirements, analytical methods, laboratory certification, reporting, record keeping, notifications, certified operators, and small systems. The regulations run to hundreds of pages. The following paragraphs provide brief summaries of some of the topics included in the federal and most state drinking water regulations. Maximum contaminant level goals (MCLGs) are nonenforceable public health goals, below which there is no known or expected risk to health. Most of the primary drinking water contaminants have an established MCL and a lower MCLG. One example is lead, which has an MCL of 0.015 mg/L and an MCLG of zero. Secondary standards are nonenforceable guidelines regulating contaminants that may cause cosmetic effects such as skin or tooth discoloration, or aesthetic effects (taste, odor, or color) in drinking water. Secondary standards are nonenforceable recommendations. Individual states may adopt secondary standards as enforceable standards, so it is always best to consult state-specific regulations in addition to federal regulations. The following link provides the current MCLs, MCLGs, secondary standards, and unregulated contaminants for federally regulated drinking water contaminants: http://www.epa.gov/safewater/contaminants/index.html. Federal and state drinking water regulations provide specific requirements for contaminant monitoring, depending on the water system's source water, population served, and type of system (e.g., transient or nontransient). The regulations describe the types of analyses, frequency, and number of samples to be collected. Colleges and universities may be required to conduct their own monitoring if they are regulated by their state as a "consecutive system" or are a small system meeting the definition of a Public Water System. System monitoring is required to be planned and described in a written monitoring plan. Analytical methods are specified and must be performed by laboratories certified in each method. Reporting requirements include analytical reporting, consumer notification in case of a violation (violations are categorized depending on their severity), and annual consumer confidence reports. Record keeping requirements are specified for various data collected during system monitoring; for example, bacteriological records must be kept at least 5 years and chemical analyses at least 10 years. Federal and state drinking water regulations establish criteria under which filtration is required as a treatment technique for public water systems supplied by surface water or groundwater under the direct influence of surface water. Filtration to a specified efficiency is required in lieu of MCLs for turbidity and certain viruses and bacteria. Lead and copper are regulated through specified treatment or corrosion control requirements in addition to MCLs. Disinfectant residual concentrations for systems required to filter are specified at the entrance to the distribution system and in the distribution system. In addition, chlorine has an MCL and cannot exceed 4.0 mg/L at the tap. Disinfection byproducts, including trihalomethanes and haloacetic acids, which may pose health risks, can be formed as a result of disinfectant (e.g., chlorine) reacting with naturally occurring materials in the water. Browse to Part 141 and Part 142. Another helpful link to evaluate how and when various rules apply to water systems iswww.epa.gov/safewater/publicoutreach/quickreferenceguides.html. Links to state regulations typically can be found on each state's environmental agency Web page. Campus utilities crews will begin flushing the water distribution system ***date***, weather permitting, from 7 a.m. to 5 p.m., Monday through Friday, for approximately eight weeks. During this process, fire hydrants are opened and water is flushed through at high speeds, cleaning the pipes and removing the sediment that can affect the water's taste and color. Flushing is an essential preventative maintenance strategy for the water distribution system and helps maintain water quality and keep our water fresh. Flushing will begin between ***describe location or streets where flushing will begin*** and move eastward through campus, ending at ***end location***. Crews will work from the north to the south with ***name*** Street as the approximate northern boundary and ***name*** Street as the southern boundary. Please be cautious of people working in the streets during this time and observe traffic diversions. Sometimes the sudden rush of water can stir up sediments in the pipes and cause the water to become cloudy or discolored. These sediments are not harmful, but they may effect experiments or stain laundry. If you experience cloudy or discolored water, wait until the nearby flushing is complete, remove any aerators or filters from your plumbing, and run your cold water until it clears. This water can be used on plants or landscaping. This process doesn't typically interrupt water service, but it can happen on occasion. A loss of water pressure is more common. Flow rate provides useful information if no valves are closed. If valves are closed, flow rate may be measured but should not be considered representative of hydrant's true capacity. 1. DiGiano, F. A. February 2009. "Benefits of Shifting Fire Protection to Reclaimed Water." AWWA Journal, 65-74. Dagostino, Frank, et al. 2005. Mechanical and Electrical Systems in Construction and Architecture. New York: Prentice Hall. Office of Water Programs. 2005. Water Distribution System Operation & Maintenance. Sacramento :California State University. AWWA standards are available for a plethora of topics including pipe specifications, installation of different pipe types, water meters, water main disinfection, and distribution system operation and management. The AWWA standards are available for purchase and cost between $34 and $68 each. They are not available online and cannot be copied for copyright reasons. Standards can be purchased from AWWA.org, or by calling (800) 926-7337. You can search for relevant standards at the AWWA web page: AWWA.org.